Air Force One is the Global Command Centre of United States of America. Its mission is to transport and protect the president of United States at anytime. Air Force one fleet consists of two, Boeing VC-25A and a highly customized Boeing 747-200B. In any mission two identical planes will fly to create confusion and be ready to replace if one fails. When America is under threat of an attack, the president will be airlifted and kept airborne indefinitely with its air-to–air refueling capability. Every president gets a new pilot and once the president boarded the plane, it will be airborne within 6 minutes. In the event of a nuclear attack, it is protected from the electromagnetic pulse, and equipped with flares capable of diverting heat-seeking missiles. The aircraft is also fitted with its own baggage-loader to avoid sharing any airport’s facilities. Secret service agents are also permitted to shoot on sight on board, and remain armed at all times. Costing £116,000 per hour to keep these ultimate presidential privileges in the air. 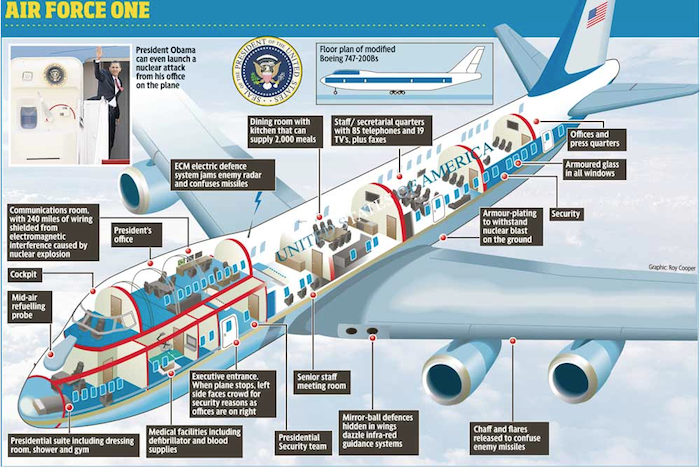 Medical area of air force one is staffed with a doctor and a nurse contains a pharmacy and even includes a foldout operating table in case surgery is ever required in the skies. One day, you or your kid may hold this most powerful office above the clouds.